If you’re planning an upcoming trip, it’s important to stay organized and plan ahead. Whether your travels take you somewhere halfway across the world or a small road trip, there are a few things you should know before you take off. Cut off some of the stress with these tips for creating itineraries, packing carry-ons, and organizing your travel essentials and will help make sure your trip goes smoothly. Before you start any trip, you should always plan ahead and create a checklist. Research the conditions and requirements for your trip and make a checklist of things you will need to pack. Make a checklist of things you need to do ahead of time, such as rent a storage unit for the duration of your travels, and give yourself plenty of time to ensure that you don’t forget any necessary items. You also want to avoid overpacking and your checklist will help you remember to pack only the necessary things. If you travel frequently, you can make a checklist on your phone and update it as you go. If you’re planning on going on a road trip, be sure that your car is road trip ready. Clean out any clutter that you won’t need on your trip and this will also give you more room to pack your things. Make a list of travel essentials like money, maps, snacks and batteries to ensure a fun and comfortable ride. It’s important to let friends, family and trusted neighbours know where you are going, how long you will be away and how to reach you in case of emergencies. This is particularly important if you are going to be away for a long period of time. If this is the case, it may be beneficial to move some valuable things into a storage unit and provide a trusted person with access. You can also let your post office hold your mail and newspapers so they don’t clutter your front door. Also, remember to contact your credit card company and let them know that you will be travelling abroad as foreign credit card charges can raise red flags and potentially block your card. 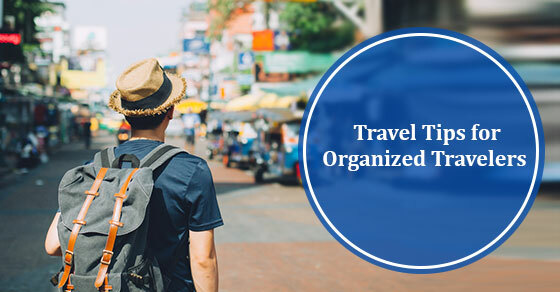 To make things easier and organized, create an itinerary with things like flight numbers and times, phone numbers of travel agents, rental car companies airlines, and hotels, addresses of hotels and any place you plan to visit. Also, when out of the country, make sure you know the address and phone number of your country's embassy. It’s good to have all of this information written down as it will save you from wondering where you're supposed to be and how you're getting there, even if your phone battery runs out. If you have pets, arrange for them to be taken care of by a facility or a friend. You should also find someone to take care of your home if you have plants that need to be watered. Store valuables in a secure place to keep them safe. You can also set timers for interior and exterior lights in your home so it doesn’t look like your home is empty. Consider a storage unit if you really want your items to be protected while you are gone, especially if you are travelling for a long period of time. Make a list of essentials that you need and keep it simple. Take neutral coloured clothing items that can be mixed and matched with each other. It’s easier to plan your outfits for the week before shoving everything into your bag. A method to save space and prevent wrinkles is to roll up your clothes. Also, bring extra plastic bags in case there are any leaks. The bags can also be useful for snacks and laundry. Bring shoes that can be worn on more than one occasion to save on space and prevent you from carrying an unnecessary amount of weight. Any footwear can be put aside or in storage until you return. Travelling can sometimes be frustrating, so make sure to pack a bag full of snacks, drinks, and something you can do to pass the time. Pack things like books, magazines, Sudoku or crossword puzzles, knitting, music, audiobooks, DVDs, playing cards, brain teasers, or a travel guide of your destination. You could even bring a travel journal to document your trip and create memories that will last a lifetime. Journals are a great way to capture and store little mementos and keepsakes you collect on your journey. Your journal can be a place to store address cards, matchbooks, receipts from memorable meals, museum tickets, and more. You can also jot down notes you'd like to remember. We all know this task can be difficult, especially after coming back from a long and tiring trip. It’s a long process to unpack and separate and wash your belongings, but it will be worth it in the end. You don’t want your belongings sitting in your suitcase until your next trip comes along, you want to throw that empty suitcase into storage and forget about it until you need it next! Leaving home for long periods of time while you travel can be nerve-wracking. You shouldn’t have to worry about what’s going on at home when you should be enjoying your vacation. Ultrastor is a self-storage facility that can help you store away your belongings and valuables while you’re away and keep them in a secure and protected space. They have a large variety of unit sizes, climate controlled storage units, easily accessible loading area, individually alarmed units, and flexible rental packages. To learn more about Ultrastor and their storage units, contact them here.